This is ramsons (Allium ursinum, wild garlic or bear's garlic) season. I bought some seeds and sowed it in the backyard. 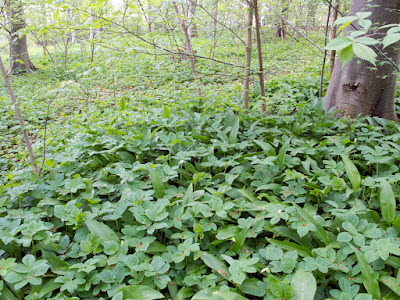 Looking forward to get my own ramsons, but until then we took a trip to collect some leaves in the forest, where it grows wildly. 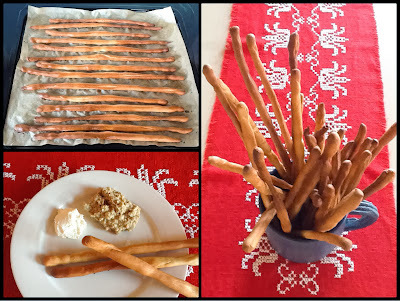 Fry seeds in a dry pan. It can be any seeds you like - my favourite ones are sunflower and pumpkin seeds. Cool them down and ground them roughly. Rinse and dry the ramsons leaves. Mash them in a food processor. Wash a couple of organic lemons. Grate the skin and press the juice. Mix ramsons leaves, seeds, zest and juice in a bowl. Spoon it in a jar tightly without leaving any air bubbles. Pour a little olive oil on it after every third or fourth spoon. Pour some olive oil on the top, too, close the jar and place it in the fridge at least for 24 hour. 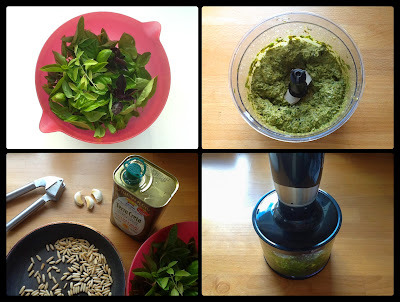 This pesto has an intense garlic taste with a long, mild aftertaste of the fried seeds. Use it on pasta, toast, lamb or beef. 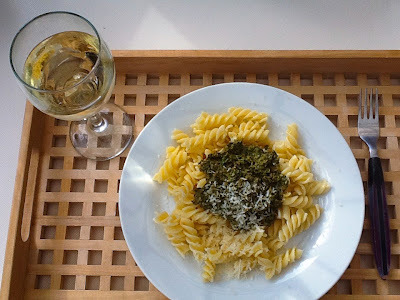 You can keep the pesto in fridge up to 6 months. Posted in Main course, Preservation, Snack. 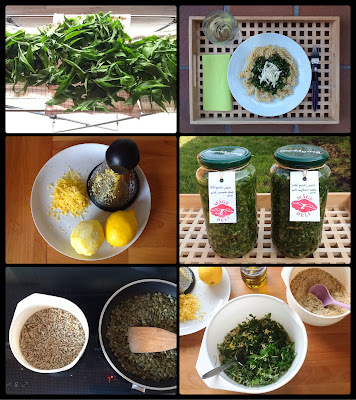 Tags: lemon, olive oil, pesto, ramsons, seeds, wild garlic on 01/04/2014 by Maagedeli. When I was a student, I used to have a part time job in a bakery with free access to the daily leftover. 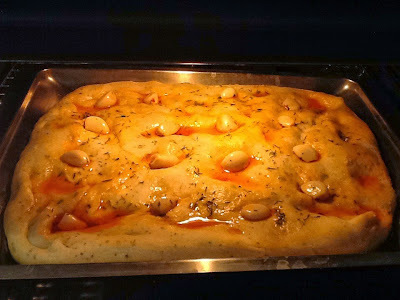 That was the time when I fell in love with focaccia. It is nice by itself, excellent with a glass of good wine and perfect with creamed soups. Mix 2 g fresh yeast with 1 dl milk and a teaspoon sugar. Let it stay in a warm place until the yeast pops up on the top of the milk (about 10 minutes). Measure 400 g white flour, 1.5 tablespoon salt and 0.5 dl olive oil. Add the yeast mixture to it and make a nice, soft dough. Cover it with a wet tea towel and let it grow for about 1-2 hours (or, until it gets double sized). Coat a baking pan richly with olive oil. Put the dough onto the pan and stretch it out with fingers. Push some holes on the dough in order to make a craggy surface. Add some topping. It can be pickled garlic, pickled tomatoes in oil, olives, onion in thick slices… whatever you like. Drizzle the dough with olive oil and sprinkle dried basil and oregano. Let the dough grow in a warm place (it can be the oven on 45 ºC) for about 1 hour. Bake it on 200 ºC for about 30 minutes, or until it turns to golden brown. Posted in Bread. 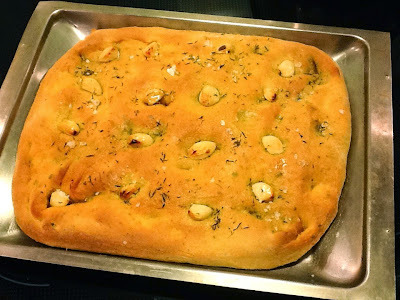 Tags: basil, focaccia, garlic, olive oil, oregano on 16/03/2014 by Maagedeli.